"The Golden Delicious harvest in Ceres is a beauty"
At Ceres Fruit Growers, a packing and storage facility for the apples and pears of more than forty producer-shareholders in the Koue and Warm Bokkeveld, the CA rooms are overflowing (contrary to the years of drought when there were unused rooms). The Golden harvest was a beauty in their region, says De Kock Hamman, technical adviser at Ceres Fruit Growers, 10% above the original estimate and nice sizing, a rebound after the drought. There was rain in February (although not the large amounts that fell elsewhere in the southwestern Cape, disrupting the table grape harvest), the local Ceres Koekedouw Dam stands at 70% at the start of the rainy winter season, so in terms of water, it’s looking miles better than previous years. Last week a cold front moved over the province, bringing down temperatures, right on cue for the colouration of Pink Ladies whose harvest starts in about 10 days. The colour’s already looking good, he notes. This week temperatures are up again into the low thirties but apple producers are holding thumbs for the drop in temperature forecast for the rest of the week. Fuji and all its different strains are also looking very good and the problem with stem end cracks, experienced during previous seasons and caused by drought and excessive heat, is not evident this season. There’s just a bit of sunburn. 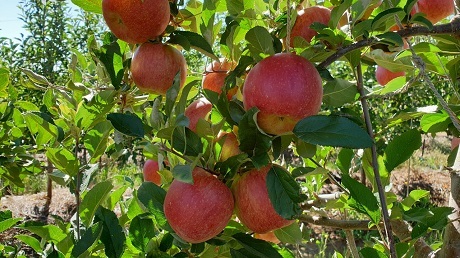 Their first Envy apples will be packed this year for the domestic market. Full red apples, like Top Red, Early Red One, Oregon Spur, bore the brunt of the heatwave last year which caused fruit drop, compounded by an outbreak of bollworm during the hot conditions that only affected the red apples. They lost around 40% of the full red harvest through this. 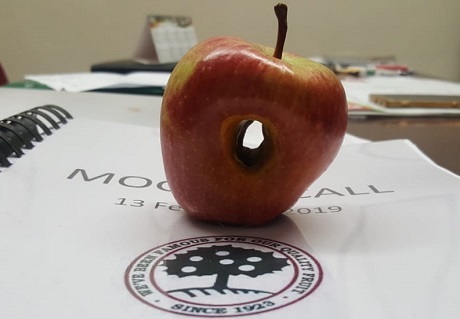 The result was that the remaining apples grew to a size De Kock calls ‘colossal’: 500g apples, too large for fresh marketing but perfectly suited for the juicing plant, also in the Ceres Group of Companies stable. Grannies are primarily planted as cross-pollinators in the Bokkeveld. The rest are packed (about 2,500t) for the domestic market, juicing or canning. The apple season normally ends around week 20 but he expects it could finish around 12 days earlier this year. The pear harvest is over, but a lot of volumes still waiting to be packed. Forelle, too, came in about 5% above its original estimate, fruit with a good size. The Packham harvest was an average size (it too felt the impact of the heatwave), a clean harvest, which they picked early before bumpiness develops. De Kock mentions that there are some concerns about the shelf life of pears, particularly early summer pears, this season. Overseas markets are sluggish everywhere, and they’ve been asked by overseas clients to hold back. All over the fruit industry traders are putting out feelers for opportunities to move supply to markets outside of Europe.